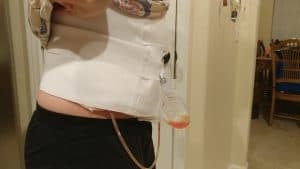 I am on days 2-4 of my diastasis recti surgery recovery; check out my previous post for my before pictures, and some good info to know before you decide to jump in! I am weaning myself down to one percocet. Normal Bowel Movement is definitely a concern, so be sure to pick up some colace and Miralax. Don’t resort to using your kiddos suppository, it’s not super comfortable…(Not that I have any experience with that… ahem) My pain is not so bad, and I am able to get up from chairs by myself. I have included some pictures; he got me pretty flat, although it’s hard to tell in the picture because I have gained about 6 pounds from fluid retention or something! The drains are not as big of a deal as they sound (they kind of scared me at first). Just keeping them securely attached to you is good. I think I pulled one slightly, but it is still stitched in. Day 3 Post Op. My surgeon provided the binder, and it’s SUPER supportive and allows me to do basic things like cook food, and even nurse my girls! Reading through my various forums for support, it seems people sometimes get tubes down their throat during the surgery itself. This results in a super raw throat, and many have suggested getting cough drops ready so that you can minimize the amount you cough. It seriously hurts, and it’s something to consider! They did not use it during mine, so not sure what you could specify to have them avoid it. Some women have opted to get lipo for their legs as well; this is sometimes part of a “Mommy Makeover” surgery. In this case, your legs are all bound up as well and you have to undo it all to go use the restroom. Something I have used while hiking and skiing so as to avoid taking your pants all the way down, and in this case, your dressings, is a convenient, foldable spout you tuck under yourself when you need to go. It converts your stream into an aimable, dripless man stream! Convenient huh? I’ll include a link; it’s hard to imagine until you see it. It’s called a “She-Wee” HAHA! 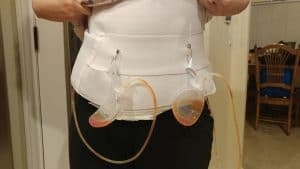 Someone super smart decided to make and sell little aprons to put your drainage tubes and such into, so that’s something to think about if you don’t want to just use safety pins like me. My son has ALMOST grabbed my tubes multiple times, and seeing as how they are stitched in, that would really hurt! Laughter is NOT the best medicine for this recovery! OUCH!!! This has possibly been the hardest part; I guess I should see it as a positive thing that I laugh so often! My next update will probably be in a couple of days, when I see the surgeon and hopefully he will take off my bandages and drains.